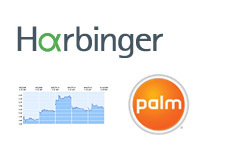 According to a new Form SC 13G filing (which was filed on April 12th and entered on the SEC's web site at 11:02 am on April 14th), Harbinger Capital Partners Master Fund I, Ltd. is the proud new owner of a 16 million share stake in PALM. The 16 million share stake in PALM means that Harbinger (which is based out of New York and run by Philip Falcone) owns 9.48% of all of the outstanding shares in the company. PALM, as you may or not not know, recently hired Goldman Sachs and Qatalyst Partners to "flesh out potential acquisition partners for the company". PALM, which has seen its shares trade from over $16 to its current level of $5.32 over the past six months, has thrown in the towel in its fight against heavyweight competitors such as Apple and Research in Motion. PALM is running out of cash (many estimate that the company could last until about mid-2011 with its current resources) and needs to make a move, as time is running out. Harbinger Capital's large position in the company is interesting. Are they buying this position because they feel as though PALM will fetch a premium in a buyout, or do they have other plans? As of December 31st, 2009, a total of 9 of the 45 hedge funds in our database held positions in PALM. This number includes heavyweights such as Citadel Advisors LLC, SAC Capital and Soros Fund Management LLC. Of the nine hedge funds that held positions in PALM as of 12/31/09, Diamondback Capital Management, LLC held the largest position (2,167,231 shares). It's worth noting that this was a 13G filing and not a 13D, meaning that Harbinger (at least for now) has a passive stake in the company and does not plan on exerting control. This could always change though.